Celebrating Singapore's 50th Jubilee Anniversary! Limited edition SG50 Futaba 18SZ! Only 50 sets. Futaba 18SZ is perfect for pro pilots and weekend wingers alike. It offers flights conditions, in addition, to many of the functions and features of top-of-the-line systems at an affordable price.. of the 18MZ. The outlook of the Futaba 18SZ resembles the top of line 18MZ. The 18SZ uses a 4.3” HVGA full colour backlight LCD touch screen that is very clear and enables visibility in both outdoor and indoor. It comes with a 2100mAH LIFE pack and a Futaba charger 7.2v 800mAH, a R7008SB FASSTEST receiver, Futaba neck strap and a heavy duty switch. The 18SZ is also equipped with speech function designed to provide the telemetry data audibly. It also allows user to set various alarms by vibrating the transmitter. This vibration function is extremely useful since pilots may not always hear the alert from the transmitter in the outdoor environment. The Futaba 18SZ uses the same gimbal as the 18MZ and hence users can adjust the stick length, stick tension, stick lever angle, ratchet or non-ratchet from the back of the transmitter according to users’ preference. The 18SZ software caters for Airplane, Helicopter, Glider and Multicopter. 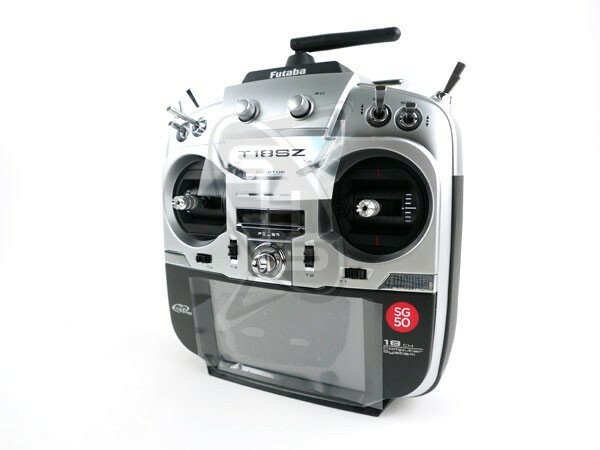 In the Multicopter mode, there are pre-designated channels for Gimbal tilt, Gimbal pan and Gimbal record. The software can be updated via the SD card subsequently whenever updates are available from the official Futaba website. 18SZ is compatibile with Futaba's 2.4 Ghz System including T-FHSS, Fasstest, and many more. The stick gimbals are similar to the 18MZ.